This message is known to appear "out of the blue" sky. In other words, everything can be fine with no problems, and then The file or folder does not exist message suddenly shows up after the user powers his or her computer on without the user even doing previously any changes to his or her system. Why does this message appear and what does it mean? This message can be triggered by creating a new folder or deleting a folder. You create a new folder and then try to rename it. You get a pop up stating The File or Folder Does Not Exist and the name then reverts to New Folder. Why does the The file or folder does not exist error appear? In case you installed the update, uninstalling the update is not known to help because this is a case of registry corruption. What you need to do is to restore the missing registry hive to its default settings. How to fix the The file or folder does not exist problem? The first option in fixing the problem is to turn off the Offline Files setting. Go to the Control panel and open the Offline Files configuration utility. 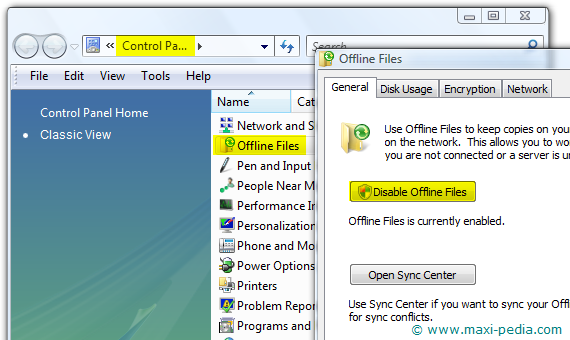 Click the Disable Offline Files icon. After making the change, you will be prompted to restart the computer. If renaming files works without problems after restarting the computer, you can change the Offline Files setting back to enabled if you need this functionality. Modifying the value was needed just to correct the corrupted registry settings. In case the above solution has not fixed your problem, the next option is to update the registry itself. Open Notepad and copy following text in it and save it to your desktop with the regupdate.reg filename. Double-click the newly saved file, and then click Yes. In case you are prompted for an administrator password or for confirmation, type your password, or click Continue, and then click OK. Reboot the computer. Now you should be able to rename and delete folders and files as you used to before the corruption took place. Wondering what else we have to offer? Take a peek at these articles.